From early in the morning Tuesday, anti-Trump demonstrators began filling streets near Cheong Wa Dae, the presidential office, where Trump was to sit down with President Moon Jae-in for a face-to-face talk and hold a joint press conference afterward. Police officers in fluorescent green jackets were also seen patrolling and guarding key points near the presidential office, as well as the US Embassy building in Seoul and the Grand Hyatt Seoul Hotel where Trump is staying. “We are on the highest alert to be fully prepared ahead of the US president’s visit and have been on patrol since 9 a.m. here,” said an officer from Mapo Police Station who was patrolling the streets near the presidential office when approached by The Korea Herald. The National Police Agency ordered the entire police force in the capital to maintain maximum readiness from Tuesday through Wednesday. It designated some streets and places as “security zones” where rallies are banned, or only partially permitted. At 11 a.m., a group called Collective Action for No Trump that consists of over 220 progressive civic organizations held a press conference just 100 meters away from the presidential office, demanding the US president refrain from making bellicose remarks toward North Korea. “Trump’s threats to conduct a military strike and the US’ hostile policy against the North dramatically increased the possibility of another war on the Korean Peninsula. 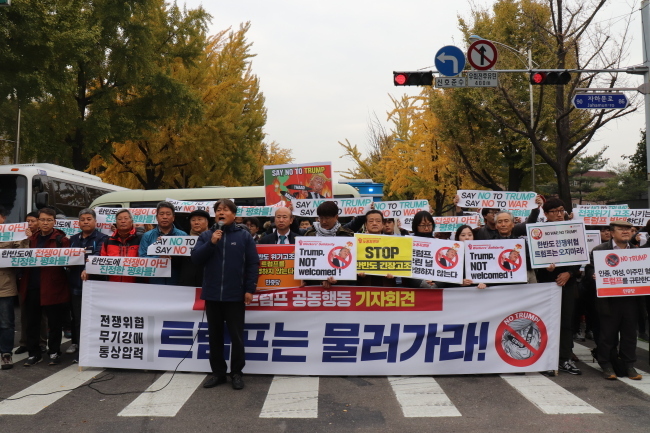 It cannot resolve the (North Korean) nuclear crisis,” an organizer of the rally said. Holding banners that read “TRUMP, NOT WELCOMED” or “SAY NO TO WAR,” hundreds of protesters said they opposed the US leader’s visit, saying he only intends to sell US arms to South Korea. In the evening, at Gwanghwamun Square, a public plaza in the heart of Seoul, protesters plan to hold a candlelight vigil for peace. They also intend to march toward Cheong Wa Dae. The group had initially planned to stage the rally in front of the hotel where Trump is staying, but was banned by police due to security concerns. Meanwhile, a much smaller number of pro-Trump civilians -- mostly elderly people -- organized their own gathering around Cheong Wa Dae and Gwanghwamun Square, waving US flags. They called for a strong Korea-US alliance and for the US’ protection of South Korea from the North’s military provocations. Nearly 76 rallies and assemblies were applied to be held by civic groups during Trump’s two-day visit here. However, some of them were rejected, including those that were to be held at the National Assembly building on Wednesday, where the US leader is scheduled to deliver a speech.